The tables have turned in this bedtime story for all of those children who have a difficult time going to sleep. 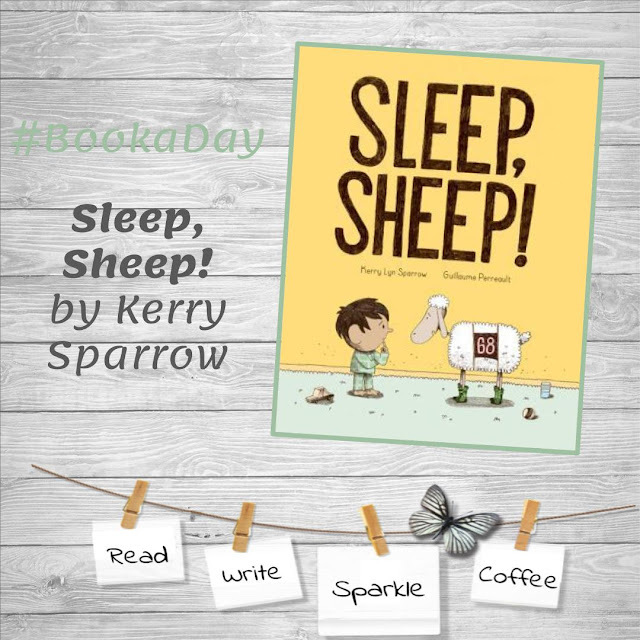 Kerry Sparrow is a literary genius in Sleep, Sheep! 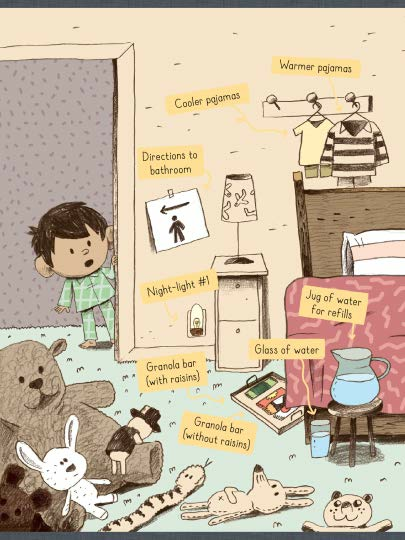 who created a solution for the child who needs one more glass of water, different pajamas, needs to go to the bathroom, etc... (why didn't think of it). The twist in the plot occurs when Duncan has everything he needs (pictured below) to go to bed and finally concludes, "but, I'm not sleepy!" Duncan's mom suggests, "Try counting sheep." Using his imagination, he finds that sheep counting can be quite effective..
From the Publisher: There are lots of things Duncan likes about bedtime --- the stories, the pajamas, the bubblegum-flavored toothpaste ... The only thing he doesn't like is going to sleep. And he'll do anything he can to avoid it. Until one day, Duncan's mom has had enough of his stalling. “Try counting sheep,” she tells him. So, he does. At first, it's kind of fun. As he counts, each sheep appears, wearing its number like a race car, and leaps over the bed. But then comes Sheep #68, who hesitates. He needs a drink of water before he can jump. Then he has to go to the bathroom. Then he wants to put on running shoes. Will Sheep #68 ever do what he's supposed to?